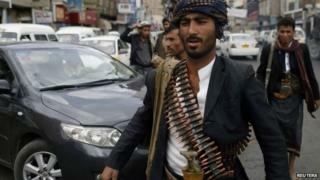 Shia rebels and suspected Sunni al-Qaeda militants have been engaged in heavy fighting in southern Yemen. Security officials and tribal sources said at least 10 people were killed in clashes around the town of Radaa in Bayda province late on Tuesday. Al-Qaeda vowed to confront the rebels, known as Houthis, after their takeover in the capital, Sanaa, last month. They have since sought to expand the territory under their control, and took the Red Sea port of Hodeida on Tuesday. The move came as President Abdrabbuh Mansour Hadi named a new prime minister after securing the backing of the rebels and their main opponents, Sunni Islamist and tribal fighters loyal to the Islah party. Under the deal brokered by the United Nations after the Houthis swept through Sanaa, Mr Hadi agreed to reverse the unpopular fuel subsidy cuts he introduced in July, form a new "technocratic national government", and appoint advisers nominated by the rebels. The clashes around Radaa on Tuesday night erupted after Houthi fighters attempted to take control of areas surrounding the town. Dozens of families were forced to flee the violence. Al-Qaeda in the Arabian Peninsula (AQAP) has vowed to fight the Houthis in defence of Sunnis and last week it said it was behind a suicide bomb attack on a rally by Houthi supporters in Sanaa that killed 47 people. On Wednesday afternoon, the rebels were reported to have sent fighters towards the city of Ibb, a bastion of the jihadist group and its allies 150 km (90 miles) south of the capital. Witnesses told the Reuters news agency that they had seen dozens of cars carrying armed Houthis arriving in Ibb on Wednesday and gathering at its main stadium, where they reportedly met the provincial governor. Another convoy of several cars carrying Houthis was later seen on the outskirts of Taiz, a city 50km (30 miles) to the south, Reuters reported. The rebels are also believed to be in control of Dhamar province, just south of Sanaa. Opponents allege that the rebels ultimately hope to reinstall the Zaidi imamate, which ruled North Yemen for almost 1,000 years until 1962. In another development on Wednesday, separatists set a deadline of 30 November for the government to withdraw soldiers and civil servants from southern Yemen. Hiraak al-Janoubi (Southern Movement) also asked foreign firms to halt oil and gas exports immediately. "The state of the South is coming and no power can stop us from achieving this," a statement said. Separatists in southern Yemen have for years complained of political and economic marginalisation by the central government and want independence for the South, which united with the North in 1990. A revolt in the South in 1994 was crushed by forces led by Mr Hadi.